4th Hole Summary: Regarded by good players as a birdie opportunity after the opening series of difficult par 4's. 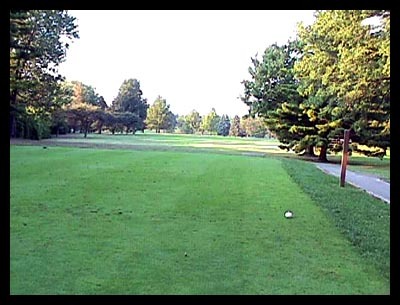 Following a drive in the fairway you'll have a decision whether to lay up in front of a creek crossing the fairway about 140 yards to the green, or carry the creek with your second shot. A really great drive will have yardage added to it because there's a drop-off about 240 from the white tee. The vicinity of the 4th green can be reached with two excellent shots, but as you will see, there's a lot of trouble and challenge around the green.